Krissy is still looking for this frog puppet. 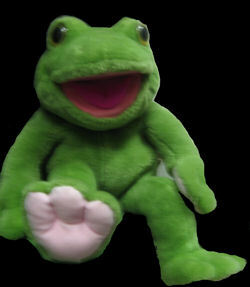 I’m looking for a large green frog puppet with pink mouth, hands, and feet. The tush tag says 24K Polar Puff Playtalkin. The copyright belongs to DCN Industries, Inc. It says Special Effects in the middle of the tag, which is a division of Mighty Star. Toadie has been a part of storytime for so long, we cannot remember where we got him, or how to begin to go about finding a back up. Sadly, his eyes are loose, and he is beginning to show signs of breaking down. I cannot imagine the trauma to all of our children here at the library if we had to go even a week without our friend, Toadie. Still looking, I know now that this is not a Folkmanis puppet, which I thought it might be, but we don’t know what it IS! Here is one that is ended but has better picture. And name Ferguson the Frog backpack by Wildkin Pack Pals brand. Maybe same maker? Or was your originally a back pack? Did you ever determine if the prior frog was close? This is a new aurora with 4 available as by now if still searching I would imagine Toadie is having a very hard time. He reminds me of a baby Kermit but no luck there either. Let us know. We have one and it still has the tag. It says: 24K polar puff playtalkin. The copyright belongs to dcn industries inc. It says special effects in the middle of the tag which is a division of mighty star inc. We got ours from the Three Little Bakers dinner theater in Delaware which unfortunately is no longer in business. We know for sure this is the same one you are referring to because ours is identical to your picture. Hopefully this is a help to you. Do you have a picture of your frog? How tall is he? How much would you want for him? We sent one to her but I never heard if she received it. I sure hope so. It was special to our family and the shipping was not cheap but we were willing to part with it for a good cause. I did receive the package, and I’m so sorry…I passed the contact info along to my librarian (I’m further down the food chain here!) and thought she had already written you to thank you! Sice she hasn’t, and I haven’t the info any more to do so, please please let me do so here. We can’t thank you enough, having a back up in case of emergency or some horrible incident befalling our Toadie is such a comfort, we appreciate your taking time and expense to help our library. The children love Toadie so, it would truly be devastating to them if they arrived some Firday morning and didn’t see him!